Soon-to-be-UT graduate Kristen Murray is undoubtedly the best argument for making sure to check junk email folders. 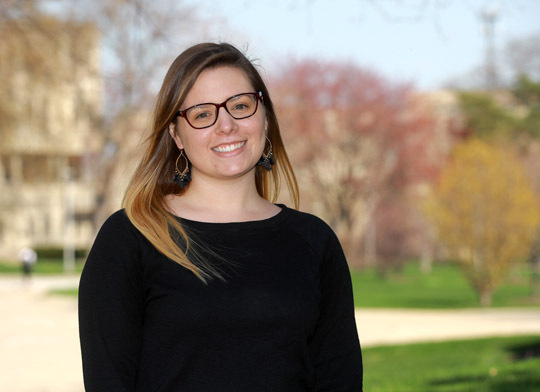 Murray, who will graduate May 5 with a bachelor of arts degree in global studies, received a prestigious gift last week — an email from J. William Fulbright Foreign Scholarship Board representatives notifying her that she’d been selected a Fulbright student ambassador to Mexico. Murray will be an English teaching assistant in a yet-unassigned area of Mexico from September 2018 to May 2019. The Bowsher High School graduate also submitted a plan to create a volleyball team in her Mexican community or participate in an existing program. The Fulbright Award is named for former U.S. Sen. J. William Fulbright, who in 1945 introduced a bill to promote goodwill between the U.S. and other countries. Today, the program awards 3,500 student scholarships each year in research, study and teaching to 140 countries. Being selected a Fulbright scholar is a competitive and, as Murray discovered, a lengthy process. She applied in summer 2017, was notified that she was a finalist in January (via an email in her junk folder), and endured a tough interview before receiving last week’s notification. Murray’s global studies advisor, Dr. Jetsa Cáceres, associate professor in the Department of Political Science and Public Administration, said the award will have benefits beyond her time in Mexico. “It’s a huge deal,” Cáceres said, noting that only 54 Fulbright Awards to Mexico are offered. “It gives students an opportunity to live abroad for a year and experience cultures, languages and opportunities they’ll never get in a classroom. The Fulbright Award is another step toward Murray’s eventual goal of working in the U.S. Department of State with a specialty in Latin-American relations. She’s had internships in Peru, Cuba and Ecuador, and was elected by the Organization of American States as an international observer of the Ecuadoran election process in 2017. Murray understands the current U.S. political climate will be a topic of keen discussion once she arrives in her assigned city. This summer, she’ll study for her GRE so she can apply to graduate schools in December. She plans to earn a master’s degree in Latin American affairs. With an “about 80 percent” fluency in Spanish, Murray also intends to use her time in Mexico to master the language while immersing herself in the culture of its people. This entry was posted on Thursday, May 3rd, 2018 at 3:44 am and is filed under Arts and Letters, Features, News, UToday .